Purists wishing to use figures all of the proper color will also need 2 copies of the Eastern Front for Tigers in the Snow, and 1 copy of the Mediterranean Theater for Operation Market Garden, though these are not required to play the game. The bonus two Standard scenarios only require one copy of Memoir '44 and the Terrain Pack to play. The second installment in our series of Memoir '44 Battle Maps includes 2 Overlord scenarios, six Tiger Tanks and 2 bonus scenarios. 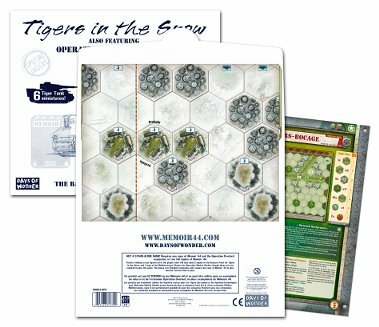 This Battle Map set also includes 2 Standard scenarios playable on a regular Memoir '44 board and featuring the new Tiger tanks - Villers-Bocage and Wittmann's last stand at St-Aignan-de-Cramesnil.